The crafting community’s effort to make this gesture of practical support to Kathreen’s family is very meaningful. I have felt the power of such acts in my own life. In the face of numbing loss, knowing that someone else recognizes that loss, and wants to help carry it, is small comfort, yet it is great comfort. Hard to explain, but I’m sure many of you have experienced this paradox. Can’t wait to see what people do to this pattern. I mean with this pattern. 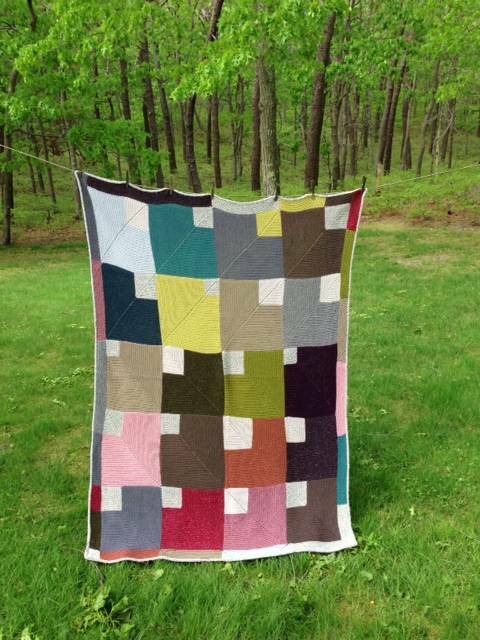 This is a gorgeous blanket design and a generous gift of a pattern to folks. Thanks! Thank you for doing the awesome work of both designer and giver. The children of Kathreen have touched my heart and I hope we knitters can offer a virtual hug around the world. Thank you! I have been thinking about that pattern ever since you tweeted the Vine of it blowing in the wind. No need for thanks, it was a pleasure to do something. The blanket turned out as beautiful as I knew it would when you announced the idea of it. Thanks for generously sharing the pattern. You are the BEST! Wonderful blanket (I’ve made several of yours)! I just made the donation and just wondered where to now access the pattern! Can’t wait – this will be perfect for my architect brother! Nice! Thanks. I hope the donations flow in. Thanks Kay, once the paywall goes up, I’ll re-up for the amount of the pattern, that way you get to feel generous and I’ll feel like they are getting a bit extra for my contribution. Beautiful blanket. Makes me want to read the book again! I am still working on my first Log Cabin blanket… we’ll see just how long it takes me to get to this one! But I am in love with it. It is simple, yet has just enough complexity to keep me interested. Thank you for the pattern for this lovely pattern and for the opportunity to make a donation for these precious children. Love, love , love , love , love. Thank you, Kay, for a lovely blanket pattern to help such a lovely pair of kids! Beautiful Kay! Can’t wait to make a Bauhaus version of this! A lovely way to remember Ann’s book and Kathreen’s family! I love simply beautiful things that tie many things together! Thank you for the blanket pattern, but especially for your caring. So many of us want to reach out when there’s a tragedy, but we don’t know how. You’ve given us the how. Thanks you for doing this!!! for Kathreen and Rob’s children.. Thanks Kay! I downloaded and donated. Yes. What you said. Thank you. Thanks. And about what you said on losses and comforts: when I was in a Situation, someone sent me flowers. I had no idea it would mean so much. Helped tremendously. That might not help everyone but for me, it was a sign that someone else at least got something about It. Ditto what Laura and Gerri said. The Internet is at the same time weird and wonderful. And the fact that people whom you have never met (and may never have the opporunity to meet) can offer you solace in dark times and it provides comfort proves it beyond a doubt. Lovely, beautiful blanket. 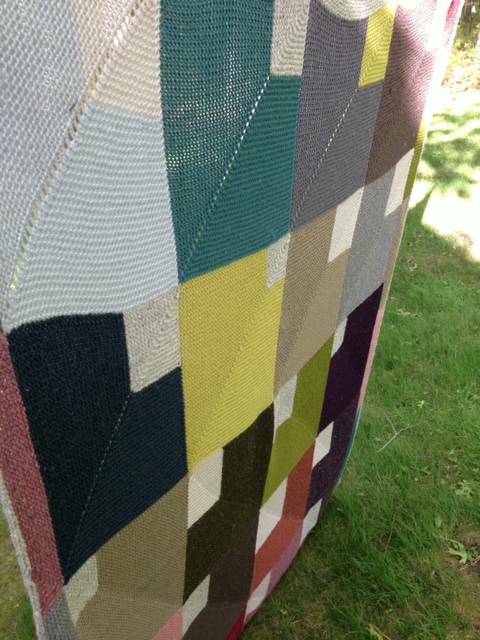 I’ve finally finished your Log Cabin blanket – now another challenge. Many thanks for your generosity. BTW – I do hold out hope that I will meet you in person someday, Kay. My BFF lives in NYC right down the street from Knitty City. We go there every time I visit, so I’m convinced that our paths are destined to cross eventually! I haven’t felt the urge to knit since before Christmas. I feel the stirrings now… And of course I’ll have to go buy the yarn since even though I have a ton of yarn, I don’t have exactly the right stuff… Thanks for kicking my knitting mojo back to life. A gorgeous blanket that is able to provide an easy way to make a donation and also serves as a tribute to Ann and her wonderful book. Thanks Kay for your generosity. It’s beautiful! Thank you so much! Thanks for another garter stitch blanket pattern. I love garter stitch and I love blankets, so I think these are perfect. I wish I had your designing skills! Thank you for leading yet another charge in knitterly charitable giving. Beautiful! Your offer of a blanket pattern gave me that oomph to donate when you first posted last week. Now the timing is perfect, I need to make a baby blanket for a co-worker! I love your blankets and will try to do something horrific to this one (that is the same as awesome, right?). Payday is around the corner, and I will then finally make my donation. The poor kids. Thanks Kay, for the moving tribute to Kathleen’s life and family. I agree, just knowing that others are out there trying to understand and support us in trying time is a great comfort. Also, thanks for another great pattern ~ I can’t wait to do something “to it”. Finally I love to witness the loving friendship between you and Ann. It is a gift to see. vitual hugs to you. A beautiful blanket and a generous gesture. I can’t imagine what those children are going through, but I can only hope now that they don’t feel so alone. That blanket is lovely. I have donated and downloaded and will give it a go when I have some free time. A question … why did you not alternate the stripes with the corner blocks rather than stack them in three and then two? Hi–In answer to Charlotte’s question, which I think is “why didn’t you alternate strips according to placement of the corner blocks rather than stack them in three and then two?”–Basically it’s because I was playing with the long diagonal lines created by knitting the blocks in the same direction over several rows of blocks. I wanted to form an asymmetric “V” such as you might see in a river or other flowing water. (Water being a major theme of Ann’s book, the inspiration for the project, and water also being a major theme in an art installation on the High Line that gave me the block idea and the color scheme.) The beauty of modular construction is that you can arrange these elements in the way most pleasing you to you. I had never read Kathreen’s blog, but your gifting the blanket pattern to all who wanted it made me understand that making a donation to her children would be a Good Thing, even if it I could not make a huge contribution. Thanks for for living life with an open hand and a generous spirit, and modeling that for us. Thank you for organizing this. I hope to make the pattern. But more importantly I made the donation.